In this tutorial, you will learn to create a Google Map app. The Google Map app will display the Google map and spot the current location of the device on the map by a red-filled circle. In case that the current location can not be retrieved at the time, you will not see the red-filled circle at the correct location. 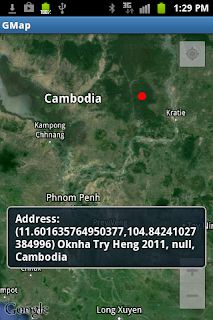 When the user touches any location on the map, the address of that location will be shown. The address to display will include latitude, longitude, street, city, and country. 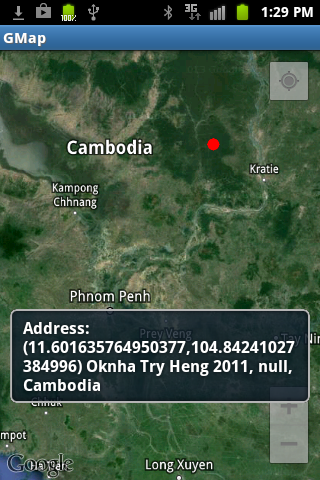 Without internet connection, the app is able to show only the latitude and longitude of the location. To get the full address as mentioned, you need to make sure the internet connection work properly. To begin the GoogleMap app, you will create a new Android Project in Eclipse. The name of the project will be GMap. Getting Google Map to work in your app requires many steps as shown below. 1. Download and install Google Play Service API. 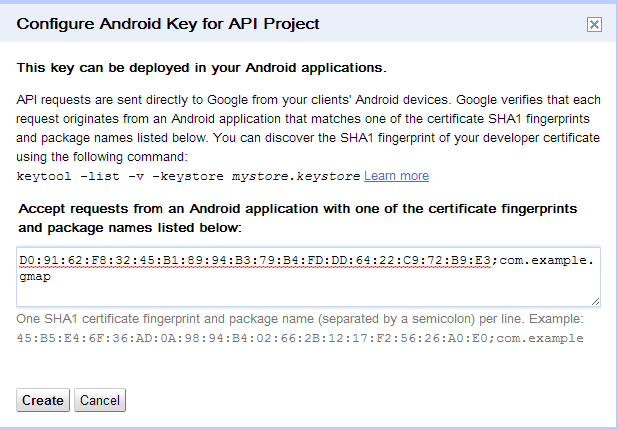 You can use the Android SDK Manager to install this API. You would get the google-play-service.jar file stored in the directory where you store the Android SDK. In my machine, this is the path of the jar file: D:\androidbundle\sdk\extras\google\google_play_services\libproject\google-play-services_lib\libs. To use the API in the GMap project, you need to add this jar file into the project build path (Project->Properties->Java Build Path->Libraries->Add External Jars...) of the Eclipse. 2. Get the SHA-1 fingerprint for your certificate. For Window 7 or Vista users, you can get the SHA-1 key by issuing the following command from the command prompt window. You will need to change the path of the keystore file. In my case, the keystore file is in the path C:\Users\Acer\.android. 0000: 2F 69 DC 79 F8 A5 07 1A 10 61 EC BD 1D E0 58 AC /i.y.....a....X. - Open Google Console then create a new project by clicking the Create... from the drop-down list. - Select API Access from the active project you created. 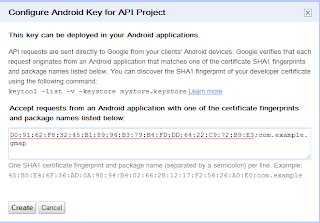 In the resulting page, click Create New Android Key....In the resulting page, you are required to enter the SHA-1 key, semi-colon, and the package name of the your project. See the picture below. - You will get the API key similar to this AIzaSyB6aqPG9XhbPMGVzkoohdlgK2HzRHe85nA. - Turn on Goole Map Android API v2 service. You will select Services and turn on Goole Map Android API v2. - Register the API key to your GMap app. You will open the AndroidManifest.xml file of the app and just above </application> paste the following code. - You will need to set some permissons and the use of OpenGL ES version 2 feature in the AndroidManifest file of your app. This is the complete AndroidManifest.xml file. Now you are ready to add a map to the GMap app. You will copy and paste (override) the following code to the activity_main.xml file. In the MainActivity class, you will need more code to show the map, apply the settings to map, identify the current location, and display the address of the location when the user touches that location. Here is the content of the MainActivity class. In the onCreate method, the determineLocation method is called to detect the current location of the device. The getSystemService method returns the LocationManager object. This object will be used to get the information about location providers. Each provider represents a different technology used to determine the current locaiton. A location on the device changes when the device moves. So to get the current updated location from Android, you will need to invoke the requestLocationUpdates method of the LocationManager class. The getLastKnownLocation method will be used to get the current locaiton of the device. In the onStart method, the setupMap, appMapSettings, and spotCurrentLocation methods are invoked. The setupMap method will show the map. The appMapSettings method specifies settings for the map. You will read he comments in code to get the idea about each setting. The spotCurrentLocation will spot the current location by a red-filled circle. The circle will cover 1000 meters around the current location. The showAddress method will be called each time the user touched the map. The getFromLocation method of the Geocoder class is used to get the address of the current location. This method return a string that contain street, city, and country of the current location. Download the apk file of the GMap app. - Ta nghỉ ngơi ở đâu? : - Đi hướng Bắc, tự nhiên sẽ nhìn đến một loạt phòng ốc, đem thẻ bài đưa cho đệ tử nơi đó, liền an bài phòng cho ngươi. - Lại có thể dựa vào tự sát mới gia nhập vào đây, thật sự là một phế vật. Đi ở bên trong Hằng Nhạc Phái, Vương Lâm dọc theo đường đi nhìn thấy phần lớn đệ tử đều là mặc áo xám, một đám bộ dạng hấp tấp, sắc mặt lãnh đạm, có một số trong tay còn cầm công cụ lao động, vẻ mặt lộ chút mệt mỏi. Vẫn hướng bắc đi được hồi lâu, rốt cục nhìn đến một loạt phòng ốc không lớn, ở đây áo xám đệ tử phải so với nơi khác nhiều hơn không ít, nhưng vẫn như cũ vẫn cứ làm việc của bọn họ, rất ít nói chuyện với nhau. Sau khi đem thẻ bài giao cho hoàng y đệ tử phụ trách nơi đây, đối phương nói cũng chưa từng nói một câu, không kiên nhẫn chỉ một căn phòng. Vương Lâm cũng đã quen với biểu tình lãnh đạm của mọi người ở đây, đi đến phòng ở, đẩy cửa đi vào nhìn thấy, căn phòng không lớn, hai chiếc giường gỗ, một bàn, quét dọn rất sạch sẽ, mức độ mới cũ cùng trong nhà không sai biệt lắm. Hắn chọn lấy một giường gỗ thoạt nhìn không người sử dụng, đem hành lý để lên, lúc này mới nằm ở trên giường trong lòng suy nghĩ rất nhiều, tuy rằng cuối cùng vào được Hằng Nhạc Phái này, nhưng cũng không phải như hắn tưởng tượng như vậy có thể tu luyện tiên thuật, lúc trước nghe ý tứ của thanh niên hoàng y kia, công tác của mình là nấu nước. details are important for this technology. Thank you for this blog. Wow. This is really amazing post. Thank you. hi welcome to all.its really informative blog.try to implement more set of ideas through it. Glad to have visit in this blog, i enjoyed reading this blogs. hi, thanks for sharing this bolg, this is very use ful to all and me. Very good knowledge and very good information. The simplest method to do this process. This is very useful for many peoples.Nice it. We'll have to share it amazing posting.I like that your moderate useful article.I read all your blog is humbled excellent blogger commenting. Very good knowledge and very good information. Very good knowledge and very good information. The simplest method to do this process. This is very useful for many peoples. There is no doubt. Your explanation was great about google map. I would like to share this information to all my pal. Its really worth to read. Your browser history and bookmarks are very useful to me. It helps my work a lot. Thank you for your pretty information. Really your information is very nice and super.you provide a very good information about web developing.Thanks for sharng keep sharing more blogs. All your points are excellent, keep doing great work. It is an informative post. Thank you for sharing with the rest of the world. This is awesome and very useful content. To find the best Android App Development Institute in Chennai click the link. This is Very Useful to me!!! Very good information about google map. Thanks to spend your great time to publish this kind of wonderful post. Thanks for the blog and it is very interesting.